Building Exterior (front). All photos by Hernandez, et al., unless otherwise noted. ​The Wycliffe Discovery Center (WDC) is a Christian community engagement center and Bible exposition founded in 2002. 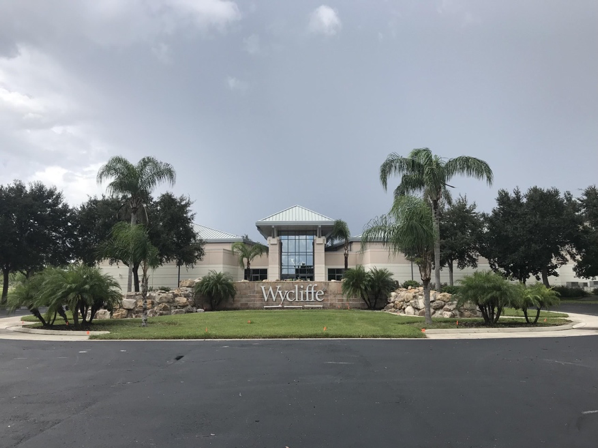 WDC is in the eastern outlying suburbs of Orlando, on a 90+-acre plot owned by Wycliffe Bible Translators. The area is circular, designed around a central lake and a smaller pond connected by a short aisle, both containing wildlife. The surrounding roads signal the owners: John Wycliffe Boulevard, Translation Way. Because of the open land and lakes, small groups of storks roam freely. The Center is within a 25-mile radius of Walt Disney World Resort, Universal Orlando Resort, SeaWorld, Fun Spot, and the Millenia Mall. The WDC is affiliated with Wycliffe Global Alliance, a coalition of regional and national organizations around the world whose common mission is Bible translation. William Cameron Townsend (1896-1982) founded the Summer Institute of Linguistics in Guatemala in 1917. It was re-instituted as Wycliffe Bible Translators in 1942. The center is named after John Wycliffe (1330-1384), a medieval English theologian that first translated the Latin Vulgate New and Old Testament to Middle English. The Wycliffe Bible Translators established centers globally as a single organization until 1991, when it was re-structured as the Wycliffe Global Alliance. The organization has active translation teams throughout Europe, the Americas, Africa, Asia and the Pacific. Out of the world’s estimated 7000 languages, 650 have full translations of the Bible and 1500 have partial translations. Another 2500 are currently in development. 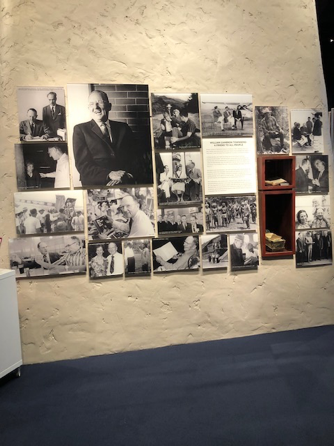 The WDC is a visual and interactive display of the history and practices of Wycliffe’s mission: to make biblical texts globally accessible through indigenous languages. The WDC delivers guided tours in English and Spanish, and many exhibits provide information in additional languages. 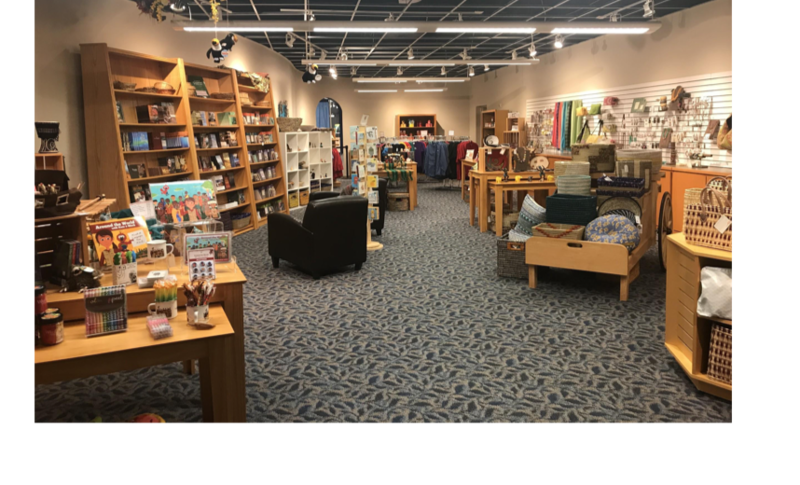 The 16,000 square feet of exhibitions are designed primarily for families, church groups, and homeschool groups, catering particularly toward evangelical Protestants. The Center’s reviews on TripAdvisor confirm this tourist demographic: out of 45 reviews, 43 were positive. These comments repeatedly praise a “family-friendly” and “wholesome” environment, the educational value of its exhibition, and the organization’s missionary ambitions. The Main Hall: Photo taken from the front entrance looking toward the back patio exit. Banners featuring culturally diverse people representing places where Wycliffe has done translation work. ​The front entrance leads to a large, open hall at the core of the building. Small display cabinets (not pictured) are dispersed along the perimeter. 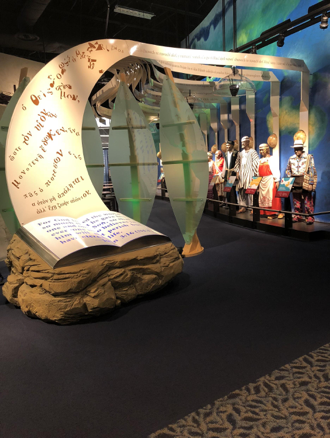 Each display features an open bible, decorations replicating the displayed bible’s time era, an information sheet, and artifacts such as small statues from countries where the Wycliffe Global Alliance has worked. 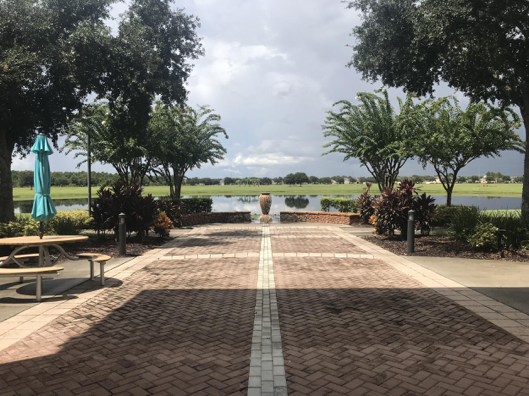 The back exit on the opposite side of the hall from the entrance opens to a cobblestone patio area on the edge of the main lake, with tables, a fountain, and some simple landscaping on each side of the fountain. Near the back exit is a hallway off to the side lined with paintings. Each is a portrait of a citizen with which the Wycliffe Global Alliance has translated a bible to their language. Beside each portrait is a plaque naming the language and country and a short background. Portrait of William Cameron Townsend (lovingly referred to as “Uncle Cam” by the portrait’s biography). Writing is Revelation 7:9 in indigenous language. Patio (back exit): Plaque at the base of the fountain reads “For the earth will be filled with the knowledge of the glory of the LORD, as the WATERS cover the sea. HABAKKUK 2:14”. ​The exhibit area is relatively small; all exhibits fit in one large room close to the entrance. The path along the exhibits circles a wide rectangular pillar that stretches to the ceiling. The circular course connects the path with the exhibits, making navigation clear and continuous. Certain subdivisions of the room are geared toward adults, others are geared toward children, and most displays are interactive. Nearly every display features a map that demonstrates the scope of Wycliffe’s impact on bible translation in order to emphasize their global ambition. Side of the central pillar visible from the children’s exhibit, connecting to the dress-up area. 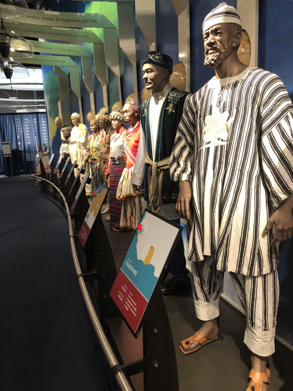 ​The first exhibit is the mannequin display with clothing from cultures with which Wycliffe works. Each mannequin has a map with the location of the culture represented and an auditory sample of the language. Some maps have an “X” where the name of the location would be written, which they explain is so that “persecuted Christians” can be protected. ​The exhibit entrance displays a large open Bible upon a rock. The text is John 3:16, “For God loved the world so much that he gave his one and only Son, so that everyone who believes in him will not perish but have eternal life,” written in English, and from it are the same words in multiple languages along the length of the arch entryway. ​At the end of the row is an empty space where a mannequin should stand. The plaque explains that it represents languages that do not yet have a completed translation. Wycliffe has authored a “Vision 2025” statement, which explains that their goal is to have a Bible translation started in every language by the year 2025. Recall, WDC estimates 4850 languages are without partial or complete biblical translations. Next along the path is a small, dark theater which offers a presentation in English, Spanish, or Korean. On the walls of the room are photos of culturally diverse individuals. All photos are kept dark, intended to signify the darkness of a life without access to the Bible. As each picture lights up, the depicted person explains how their lives have been changed since they converted to Christianity. At the end of the mannequin display, the room’s central column becomes visible. The surface of the column visible at that angle is embedded with Bible-translation-history vignettes, and behind it, the fixed pathway opens to a larger expansion of floor that holds the children’s exhibits and play area. ​After kids walk through the hut, they arrive at an activity which instructs them to load a canoe. “You are heading out to translate the Bible for a people group. What do you need to take to help you with your work?” From here, kids load colorful foam blocks into the canoe, each of which signifying translation materials such as food, water, money, and computers. Behind the hut is a dress-up area with a tropical backdrop where children can try on the traditional dress of cultures around the world. There is also a market stand with play groceries and a cardboard parrot as the “merchant.” And, there is an arts and crafts stand where children can color traditional outfits on paper, as well as an activity in which kids make necklaces out of leaves with the names of “Bibleless” people groups written on them. In this activity, children are asked to toss a bean bag on the small board on the floor. Wherever it lands (Russia, Uganda, Solomon Islands, Brazil, or Nepal), the child is encouraged to pray for that country’s people and that God may someday send them there as a missionary. 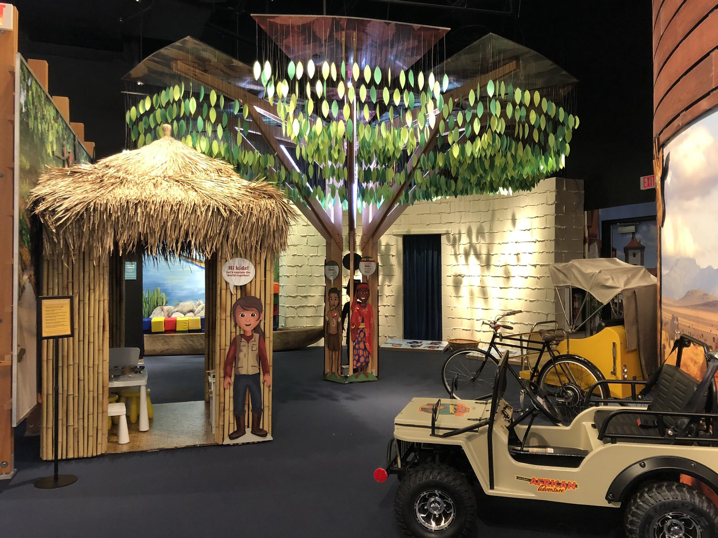 In addition to the exhibits themselves, WDC conducts a series called “Homeschool Days,” a handful of dates per year dedicated solely for homeschooled children to congregate and learn about Bible translation. Elementary school age students participate in crafts, games, and storytelling to learn about different cultures and Bible translation. Middle school through college-age students study linguistics and missiology. The Center also holds additional events for homeschooled students during the summer and close to important Christian holidays, such as Christmas and Easter. The exhibit following the children’s area is a concave with three walls. Each wall lists events in the history of Bible translation and in Wycliffe’s missionary work. 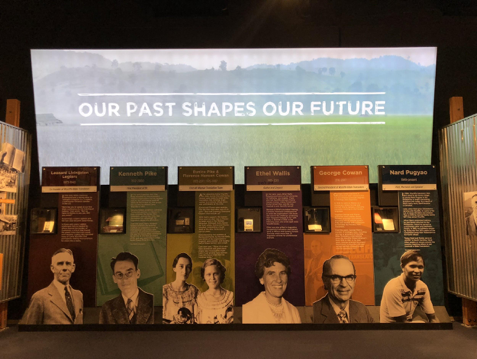 This display area is geared toward adults: there is minimal interaction required to experience the exhibit and photographs along the walls are accompanied by lengthy text descriptions. The screen at the top, “Our Past Shapes Out Future,” towers over visitors at a slight angle. 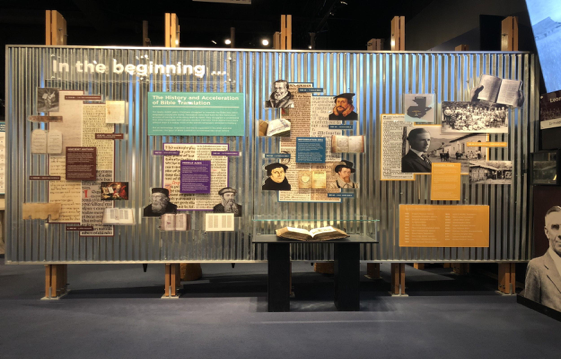 The exhibit tells a story of the Protestant Reformation, and how Wycliffe’s mission is a continuation of John Wycliffe’s and Martin Luther’s commitment to making the Bible accessible in vernacular languages. “In the beginning...” clearly expresses the order of events on a timeline streaming from left to right as time passes. But, the physical placement of the displays also implies Wycliffe’s actions to be a catalyst from which all other events portrayed derive. The final set of displays are a call to action. 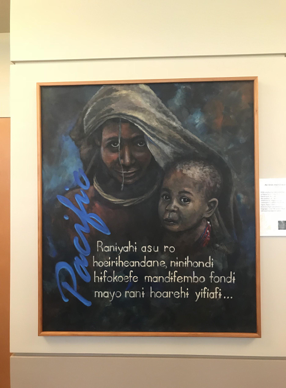 The room is lined with statistics about people without bibles available in their native language, further instilling a sense of urgency to support the organization. Bibles of different languages on book display stands decorate the surface lining the walls, physical evidence of missionary translators’ work. Pamphlets encouraging donations, volunteers, and participation in community events instruct visitors how to show support. Computers sit alongside the bibles for visitors to subscribe for news updates, browse the Wycliffe websites, and transcribe their name into another language (including American Sign Language and Klingon) and print it as a free souvenir. The Village Shop is WDC's version of a museum gift shop. Visitors can purchase handmade jewelry, bags, baskets, scarves, and soaps from different world regions. Most products in the shop are from regions in which Wycliffe has a partner organization or missionaries. The shop also sells standard museum gifts, such as cards, mugs, and logo apparel. Games and books for children are religious, multiculturalism- and missiology-focused, or both. WDC sells its own books starring Kate the Missionary and her pet Mack the Parrot, characters featured in the children's exhibit area. Books marketed toward adults are also sold, including: bibles, prayer books, and Christian self-improvement books. The Wycliffe Café, open for lunch on weekdays, consists of a large room dotted with round tables where visitors can sit and eat, as well as a separate space where the food is served. 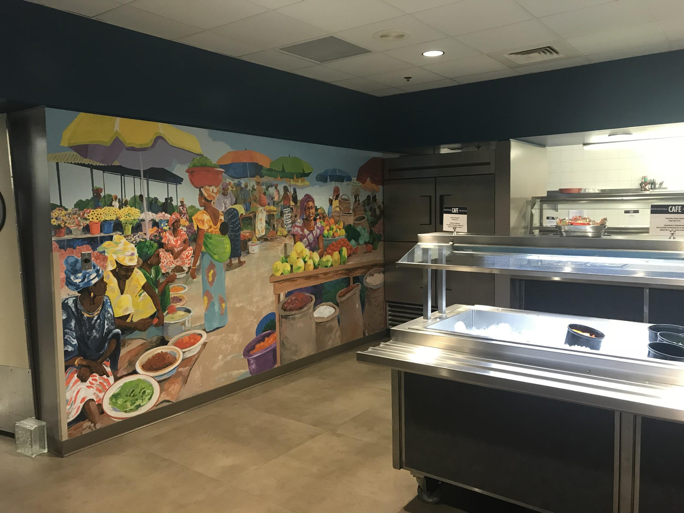 The colorful mural in the back is the decorative centerpiece of this room, depicting a bright and colorful market scene where a variety of foods are being sold. The Cafeteria is a large ballroom with a tall ceiling. 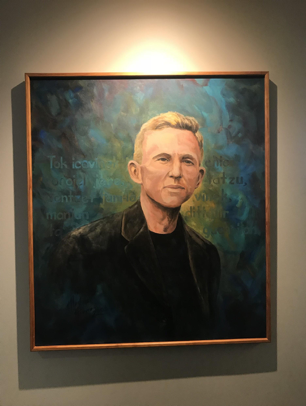 Above the entrance is a 32-foot long mural, which is designed to signify the lightness brought by “God’s Word.” The artist is from Panama and the son of two Wycliffe Bible Translators. 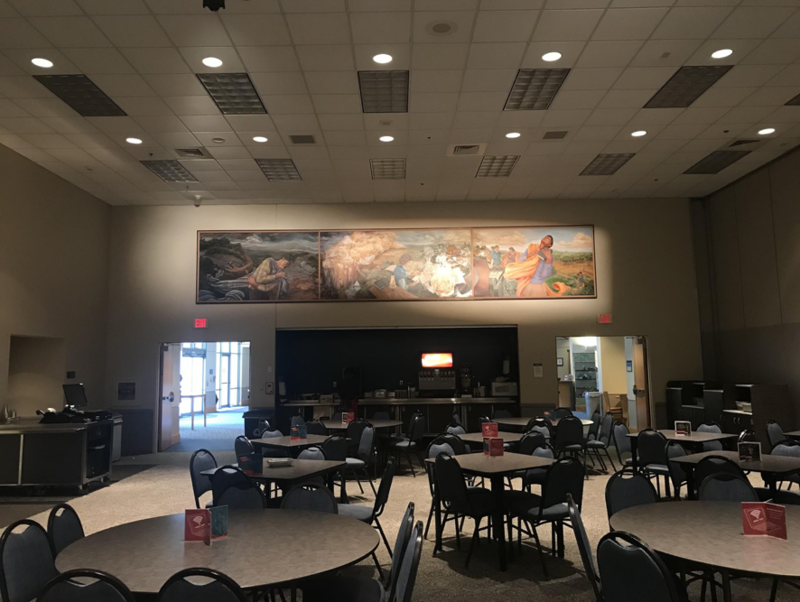 The far left of the mural depicts a man suffering alone in a dark, barren landscape; the far right shows a man in colorful wear cradling a bible; the landscape is bright and lush and the people joyful. 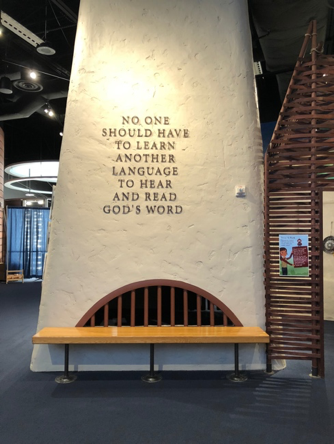 ​The Wycliffe Discovery Center takes as its governing ideology the notion that the bible should be available in every spoken language on earth. By framing the work of translation as the fulfillment of a need rather than the pursuit of a desire, WDC constructs a narrative in which biblical colonialism emerges as a form of esteemed charitable service. While the mechanical act of translation may be performed by a select few, the interactive displays—which collectively are designed to engage the full spectrum of the visitor demographic—and posted calls to action communicate that the full project of translation is a collaborative process that requires the support and assistance (in the form of monetary donations, supply drives, and prayer) of the entire evangelical Christian community. 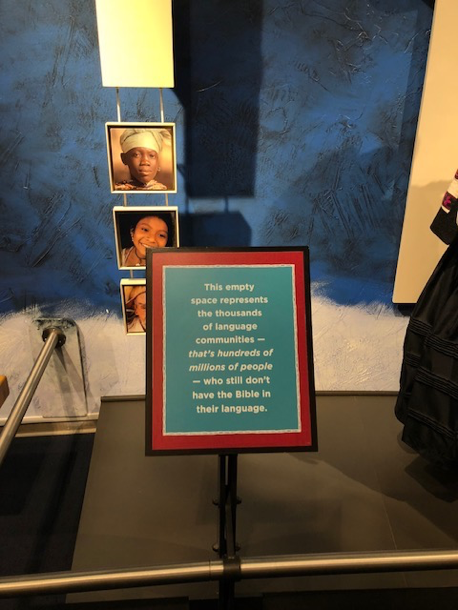 By affirming the privileged status of the bible and enlisting visitors’ assistance in extending its ideological and practical reach to hitherto untapped reading populations, WDC’s mission both aligns and intersects with that of other bible engagement centers and expositions, most notably Washington D.C.’s Museum of the Bible. 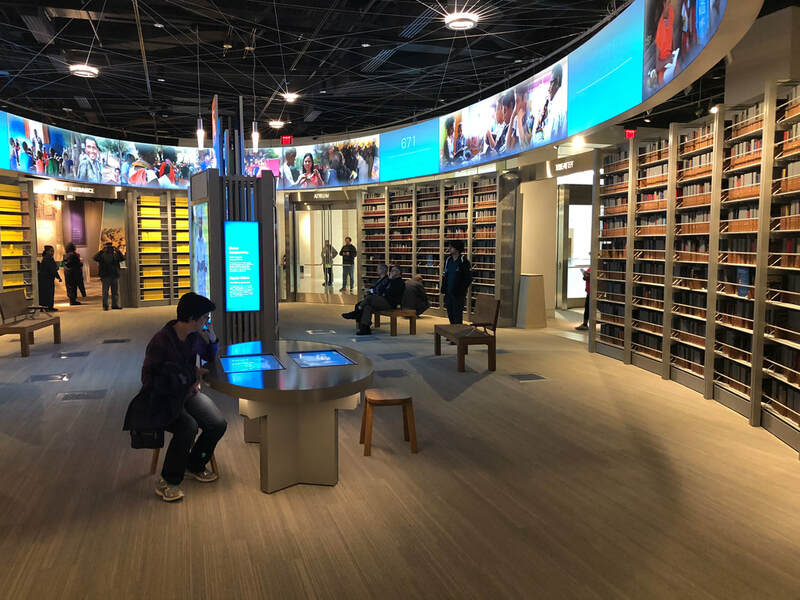 The latter features an exhibition room that contains floor-to-ceiling bookshelves which are partially filled with bibles translated into different world languages. The purpose of the so-called illumiNations display is to highlight how many spoken languages into which the bible already has been translated, and, through the empty shelf space, how much work still remains. According to WDC staff members, the illumiNations exhibit at the Museum of the Bible was directly inspired by WDC, and the material bibles on display came from the Center. "illumiNations" exhibit at The Museum of the Bible (Washington, D.C.). Photo by James S. Bielo.